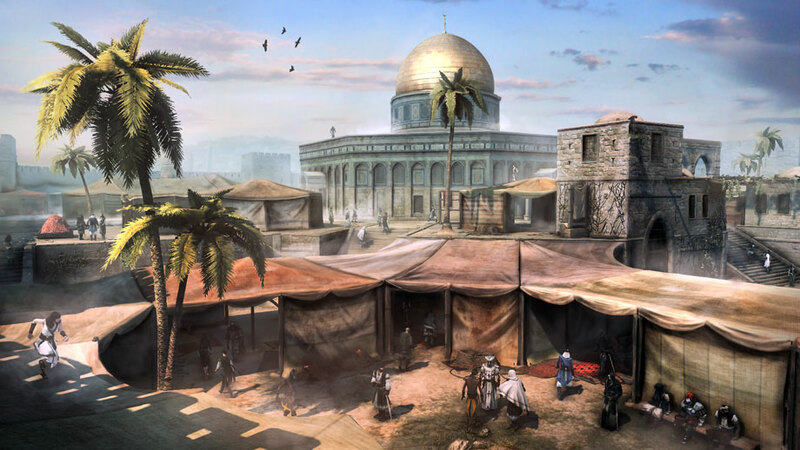 OnLive Released the Mediterranean Traveler Map Pack DLC for Assassin’s Creed: Revelations. The Assassin's Creed: Revelations - Mediterranean Traveler Map Pack add-on costs $9.99 in the US ($6.99 PlayPack) and £7.99 in the UK (£5.59 PlayPack). The Mediterranean Traveler Map Pack extends the Assassin’s Creed: Revelations multiplayer experience with the addition of 6 multiplayer maps, each introducing new gameplay opportunities through their varied terrains, perches and hideouts. This all new add-on content also comes with a new collection of achievements for those that want to try their hand at kills and escapes that are as impressive as they are effective. Journey to the majestic holy city of Jerusalem, the opulent Imperial District of Constantinople, and the colorful mercantile district of Dyers. Revisit your favorite Italian Renaissance maps from Assassin’s Creed: Brotherhood, starting with the historic city of Firenze, traveling to the mountain sides of San Donato, and to night time Siena with its carnival lights, talented performers and deadly hiding spots. Give all your multiplayer characters some personal style with bonus multiplayer customization items, also included in the pack. For generations, poor and rich families of Rhodes have met in the Dyers district, where the freshly tinted fabrics and the flavored olive oil are a thriving business. Whether you want to blend in the Hammam district or test your freerun skills in the more chaotic trading area, the mix of urban and rural architecture will offer a great playground... choose your strategy wisely. You couldn’t find a better place to improve your skills than the Imperial district of Constantinople. The main plazas are ideal points of observation, while the many surrounding streets are easy escape routes. One can easily blend in merchant stands and groups of walkers, waiting for his target to reveal himself, while some will prefer to get on the high roofs to get an overview of the area. Worshipers come from all around the region to this place of pilgrimage, and after their long journey they don’t like to be disturbed. Be sure that any suspicious behavior will be easily spotted in this peaceful site, though you should try to blend into the silent processions and wait for the right moment to strike on your target!